We’re on a recipe roll in the DINE blog. In last week’s blog posting, we created a compendium of links to recipes featured from DINE innkeepers. 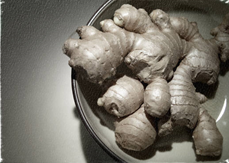 This week we’ll continue our focus on food with a spotlight on one of the healthiest ingredients you can find – ginger. Good for what ails your stomach and offering strong anti-inflammatory compounds, many of the 11 DINE member inns offer wonderful recipes featuring this power-packed ingredient. That means even if it is sweet and yummy, you can feel good about eating ginger treats at any of the 11 DINE member inns. There are too many to list in one blog posting, but we’ve included three fabulous recipes for sweet treats featuring ginger. They’re easy enough to complete at home, but next time you don’t feel like baking, let one of the Distinctive Inns of New England do the baking for you. Whether served at breakfast, afternoon tea or a welcome reception, you’ll top off your romantic New England getaway with a fabulous sweet treat, and if you’re lucky, it will be one of these ginger concoctions. In a hot sauté pan, add ¾ cup sugar and butter and cook over medium-high heat until golden brown. Add bananas and ginger and remove from heat. Stir in ½ cup heavy cream and let rest until cool enough to handle. 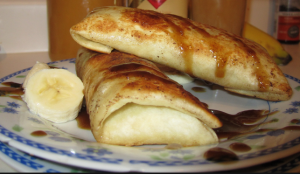 Spoon banana filling into tortillas and roll as you would a burrito. Use a toothpick to secure. Fry in canola oil at 330° to 360°F for 1-3 minutes or until golden brown. Drain well. Bring 1 ½ cups cream to boil. Remove from heat and temper in egg yolks. Stir in sugar, cinnamon, and espresso. Pool cream in center of plate. Slice wrap in half on a bias and place on cream. Garnish with ice cream, flowers, mint, and powdered sugar. Combine first 6 ingredients in a large bowl, stirring to combine. Add pears, toss gently to coat. Spoon pear mixture into a shallow 2-quart baking dish lightly coated with cooking spray. Lightly spoon flour into a dry measuring cup, level with a knife. Combine flour, oats, brown sugar, cinnamon and 1/8 teaspoon salt in a medium bowl. 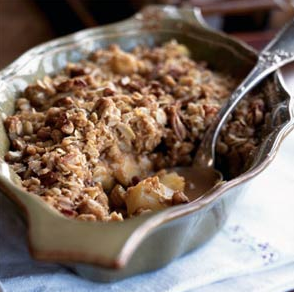 Cut in butter with a pastry blender or 2 knives until resembles coarse meal, and stir in nuts. Sprinkle flour mixture over pear mixture. Bake at 375oF for 35 minutes or until topping is lightly browned. Cool on a wire rack for 10 minutes. Preheat oven to 350 degrees. Whisk together pumpkin, brown sugar, egg, cinnamon’ and ginger in a medium bowl. Whisk in cream until well combined. Divide mixture evenly between 6 ramekins. Place ramekins in shallow roasting pan. Pour boiling water into pan, half way up the sides of the ramekins. 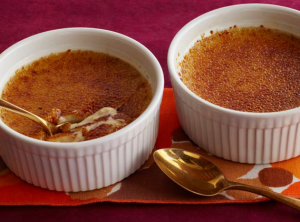 Bake until custard barely moves when you jiggle the ramekin, about 30-40 minutes. Remove ramekins from roasting pan and let cool. Refrigerate at least 4 hours. Just before serving, sprinkle tops of custard with sugar to cover completely. Turn upside down to remove excess sugar. Ignite blowtorch and caramelize sugar until evenly melted. Serve immediately. Winter is the perfect time for that delicious and romantic New England getaway. Don’t forget to make plans to visit one of the Distinctive Inns of New England for you next escape. Note: Photos via Google Images. This entry was posted in advice, breakfast, Captain's House Inn, Chesterfield Inn, culinary travel, Distinctive Inns of New England, Rabbit Hill Inn, Recipe and tagged B&B recipes, breakfast recipes from inns, culinary travel, ginger recipes, innkeeper recipes, recipes from Distinctive Inns by admin. Bookmark the permalink.